I am grateful this week that the Heavener Runestone Park has invited me back to the Viking and Celtic Festival April 9 & 10. They hold the festival twice a year, April and October. I met some wonderful people last fall and can’t wait to get back again. One of them was Park Manager Erin Bruesch. If you don’t know about the park it is in Heavener, OK 15 miles south of Poteau in southeast Oklahoma. It is near the beautiful Talimena Drive; and a great place to take the kids and hike the hills and valleys. But the best part is the sandstone monolith with ancient carving. Some say it was carved by Vikings long before Columbus. 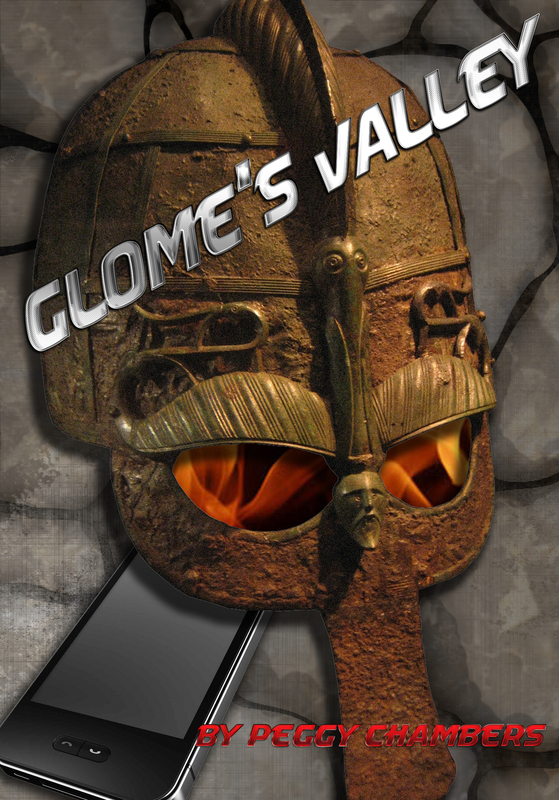 Whether you believe that or not, it is a magical place where I set the book Glome’s Valley. I found Erin last fall when I arrived at the park looking for my vendor slot. I set up a canopy for the weekend while she roamed relentlessly over the park solving problems and making everyone feel welcome. She is a great asset to the city-owned park and is determined to get the word out about the historical significance of the park and its stone. PC—Erin, tell us about your background. Who you are, where you are from? EB – I grew up in a small town in Southwest Minnesota. My father is a farmer and my mother is a school teacher. I am the middle child of three with two brothers. Every summer our family took a cross country road trip. We traveled to about half of the United States as well as Canada, Mexico, Ecuador and Germany. I have an associate’s degree in Fluid Power Technology and I’m ¾ through a bachelor’s degree in mechanical engineering. If I could do it again, I would have gone into forestry. PC–What do you love most about your job? EB – The people I meet all have a unique story. I meet people from throughout the United States as well as all over the world. Since July I’ve met people from more than ten countries. Living at the park is pretty awesome, too. Although, I don’t spend as much time hiking as I had anticipated. If you haven’t experienced the view from Poteau Mountain, you should. People come to the park every evening to enjoy the sunset. PC–What prompted you to take the job at the park? EB – I heard about the job from a friend. I spent quite a few hours visiting with Karry, the previous park manager. At first I thought that this was more of a dream job and that I needed a job with health insurance and a 401k. However, an opportunity like this doesn’t come along every day. My husband is from Heavener. It’s just fun to be a part of this park and community in this way. PC – What do you hope to achieve with the festival this year? Next year? EB – Bigger. The festival has grown every year and we still have room for more. Most of the vendors and performers are return guests, but every year we get a few new ones. We have about 20-30 vendors and 1000 or so patrons who attend. We also are reaching out to a greater area through social media as well as radio and newspapers. There are still local people who don’t really know what the festival is all about. It’s the best venue in Heavener. PC—Do you believe that Vikings were in Oklahoma before Columbus first visited this continent? Why or why not? EB – I could write a book on this question, as many people have. Coming from Minnesota, where Viking is in every child’s vocabulary, of course I believed in Viking travel at least in Canada and the north central and north east United States. When I came to Oklahoma in 2011, Heavener Runestone Park was one of the first places I visited. To be honest, I was as skeptical as anyone. When I took this job I decided that I would learn everything I could about runic writing and decipher the translation myself. Unfortunately, the Futhark is such an ancient and foreign form of writing that it is not a simple task. Even Runeologists and Linguists have some discrepancies in the translation. Regardless, the more research I do the more possible it seems that Vikings may have traveled here to this very spot. The location of the stone, which is in the small mountain creek bed not far from the Poteau River, would have been travelable by Viking boats. The bottom line is that if Earth is 4 billion years old, or even 4 thousand years old, it is not likely that foreign visitors didn’t arrive until 1492. PC–Tell us about the Heavener Runestone Viking and Celtic Festival. Who attends and who should attend? EB – Whether you’re a history buff or Viking enthusiast or not, the festival is for anyone, any age. We have 5 musical groups and birds of prey show on main stage. At the battle ground you can experience scripted and non-scripted fights. People can try their hand at axe throwing and various games. The blacksmiths fire up their coal forges and make custom knives, swords, roses and other trinkets. Our vendors sell everything from Viking period clothing and accessories to armor and swords to jewelry of all kinds. There really is something for everyone. PC–How can people interested in the park contact you? EB – Facebook is a great this for this park. We share information about upcoming events and encourage visitors to share their photos and experience here at the park. Search Heavener Runestone Park. We also have a segment on TravelOK.com that we keep updated. Call us at the office 7 days a week from 8am 5pm or email at heavenerrunestonepark@gmail.com. The Viking and Celtic Fest is April 9 & 10, 2016. Come out to the park and bring the family. You’re sure to find something that peaks your interest and the kids will love it. There are food trucks or you can bring your own picnic for a day in the forest. See you there! This entry was posted in Uncategorized and tagged Celtic, family outing in Oklahoma, Heavener Runestone Park, Talimena Drive, Vikings. Bookmark the permalink.